At 0 (default) it has the first tab selected. Any other number and notabs are selected. Is there a setting somewhere else that I am missing?A: You can set "bselectedItem" and " var bselectedSmItem" parameters based on your link before you call your data file. If the word is too long, the dhtml menu images are not correct. Please look at the screenshot. I just purchased it today. Use braces: window.open(). 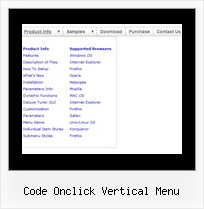 PHP Code: echo "<td width=230 style='vertical-align: top' class='boxInactive' onclick=\"window.open('list.php?